Fish tacos have become a regular on the menu in our household - they're a stress-free option to serve for get-togethers, especially in the summertime when you don't want something too heavy. Guests can mound whichever toppings they like onto a hearty taco shell, and all you have to do is scatter a few different toppings across the table. If you're having a lot of people over, this really is an easy way to entertain. Most of the toppings can be made ahead of time and the fish can be prepared in a few minutes once your guests arrive. I like to serve these with an ice-cold jug of watermelon juice and/or glasses of berry mojitos. It's more relaxed than a sit-down dinner and perfect for a warm summer evening where you want to eat outside. If you're hosting a potluck, have every guest bring their favourite taco topping while you provide a few of the essentials. Here are a few of my favourite toppings. I also love serving these with shredded red cabbage, grilled corn kernels, purple rice and orange salsa. What are some of our favourite fish taco toppings? Cilantro-Mango Salsa: Cut a ripe mango into thin strips, toss with a small handful of coarsely chopped cilantro, 2 tbsp of lime juice, 2 tsp olive oil and a little salt and pepper. Serve alongside some shredded lettuce, and keep the in the fridge until time to serve. Blue Corn Taco shells: Heat at the last minute according to package instructions, plan to have 3 to 4 tacos per person. Avocado Cream: In a food processor, add 2 coarsely chopped peeled avocados, 1/4 cup lemon juice, 1 tbsp lemon zest, 1/4 cup greek yogurt, 2 tbsp chopped cilantro, 1 diced shallot, a good pinch of salt and pepper. Pulse until smooth, and keep in the fridge until time to serve. 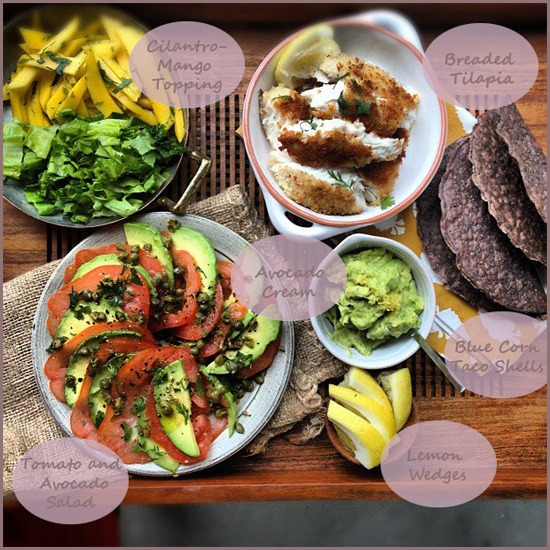 Tomato and Avocado Salsa: Layer thin slices of avocado and heirloom tomatoes. Top with a drizzle of olive oil, a drizzle of lemon, 1 tbsp of coarsely chopped capers and a pinch of salt and pepper. Serve with purple rice, lemon wedges, a sour cream on the side. This is a great idea. I have so many picky eaters in my family that letting them build something themselves is always easier. Dining Alone: Exactly! And since there is a lot to choose from, it's a great option for any guests with dietary restrictions. I love tacos too! I use shrimp or chicken more often than fish though somehow. Another topping I always have to have is..some good shredded cheddar! The combination of sour cream, guacamole, salsa, cheddar and chicken or shrimp is out of this world delicious! WHOA! This is awesome. I love everything there. I love that there's lots of fish and avocado (and that people can assemble their own food). Great idea! I love building my dinner like this but my husband complains bitterly if he has to work for his meal. My son always says, "Okay, now what do I do?" as he surveys the array of dishes. Males! OH me oh my! This is my kind o party - love to pay with my food. YUMMERS! We love taco dinners, but fish tacos are still pretty new here. We mostly have chicken or minced beef with plenty of avocado! I am too a fan of fish tacos. This looks really tempting. We love fish in our home....so quick to make! Love fish tacos and yours look fantastic!